Origin and Habitat: Madagascar, Province of Toliara. Euphorbia capsaintemariensis has a very restricted distribution coming from the Reserve of Cap Sainte Marie at the southern tip of the Island. Altitude: About 100 metres above sea level. Habitat: This species has an extremely small extent of occurrence (about 0.9 km²) and a very small area of occupancy (0.1 km²) and is in great danger of extinction because of it's very limited distribution. Euphorbia capsaintemariensis grows in wind-blown and stormy area on the flat limestone terrace (plateau) in rock cracks, fully exposed or in dappled shade through the open-canopy of low, bushes and succulents like Alluaudia comosa, Alluaudiopsis fiherensis, Aloe millotii, and Crassula humberti. This may explain why it is more sun-loving compared to Euphorbia decaryi. 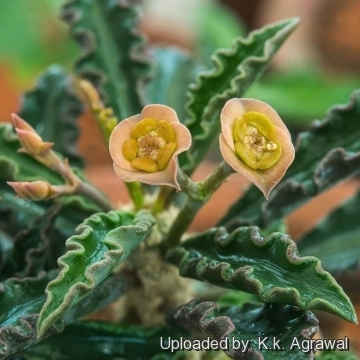 Description: Euphorbia cap-saintemariensis (a.k.a. 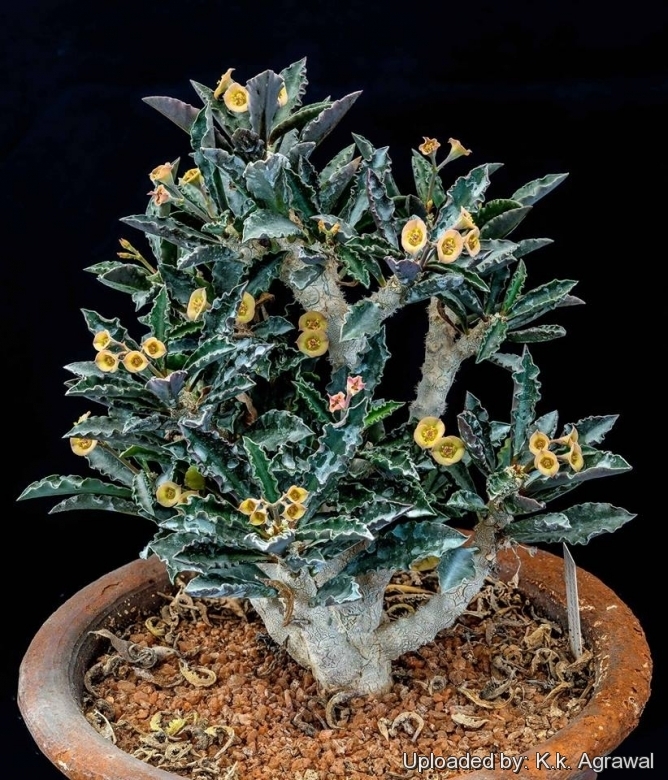 as Euphorbia capsaintemariensis) is an attractive miniature Madagascan species that produces many horizontal silver grey branches coming from a basal caudex. The branches carry deep emerald green leaves with undulate edges and cup-shaped pink-green flowers. Similar species: The erect cyathia and the more long and wide leaves distinguishes it from the similar Euphorbia decaryi. Furthermore Euphorbia decaryi has thicker dull maroon-green leaves. Euphorbia cap-saintemariensis flowers freely like Euphorbia francoisii. Habit: It has a branching and low spreading or prostrate habit; remains a single specimen and does not spread via underground stems and has a wind swept look. Roots: Tuberous, branching. Can grow to heights of about 20 cm tall and 30 cm wide. Branches: Up to 10 cm long and 5-10 mm in diameter, in a dense cluster from the crown, spreading flat, horizontal or decumbent, cylindrical, single angled with small spines and light silvery-green. The branch retains scars when the leaves drop. Leaves: Clustered in rosettes at branches tips, up to 25 mm long and 8 mm broad, sub-sessile, fleshy, canoe shaped, and very undulate around the margin, emerald green changing colours with the seasons; they turn purple in cool weather. Inflorescences: Subterminal cymes, 1 or 2 forked, erect on peduncles about 5 mm long. Cyathophylls: Spreading, ovate-acute, 3 mm long and 5 mm broad, greenish-pink with red margins. Flowers: Cyathia to 5 mm in diameter, subsessile. Fruits: Slightly lobed, about 5 mm in diameter, minutely papillose, subsessile. 5) Haevermans, T. 2004. 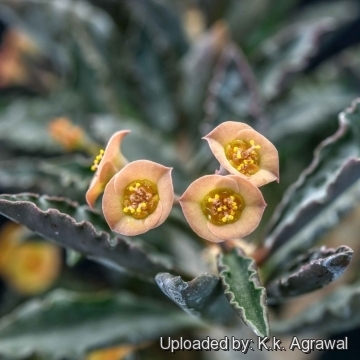 Euphorbia cap-saintemariensis. In: IUCN 2013. “IUCN Red List of Threatened Species.” Version 2013.2. <www.iucnredlist.org>. Downloaded on 18 January 2014. Cultivation and Propagation: Euphorbia capsaintemariensis is a very unusual plant and one of those that turn out to be difficult if treated as a difficult plant and kept too dry. They are indeed easy to cultivate and quite effective in a small bonsai pot. Watering: In the heat of summer the plant needs a good amount of water. Even in winter its soil should never completely dry out. Though it tolerates a dry over-wintering, it then gets in trouble in spring when it has to produce new roots. Care must be given in watering, keeping them warm and wet while growing, and cooler and dry when dormant. While young seedlings can be pushed with more water to accelerate growth, at some point of maturity watering must be reduced or it will suffer from root loss or collapse from rot. Exposure: These plants don't seem to love being blasted by the sun in the summer but prefer bright light, and will therefore not make demands on your prime growing space. However shade grown plants will tend to produce fewer, and etiolated growth (weak, gangly stems with unusually long internodes, and generally paler green colouration). The colour of this plant is much more marked if grown in full sun. 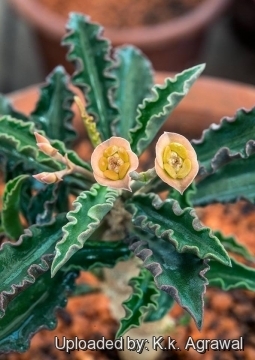 Warning: Like other Euphorbia it has sap that is poisonous if ingested and is very irritating to the skin and eyes. Propagation: Seeds, graft or (usually) or cuttings. The seed will loose viability in storage, and may not be viable the following year, so the seed should be planted as soon after harvesting as possible. Germination usually occurs within about a week or two. Branches root easily to produce new plants, but apparently do not form a tuber. First of all if you remove an offset, you have to wait about two weeks before repotting to let all wounds heal (cuttings planted too soon easily rot before they can grow roots). It is better to wash the cut to remove the latex. Place the cutting in a warm, bright (w/o direct sun) and slightly humid spot, to increase the building of new roots. 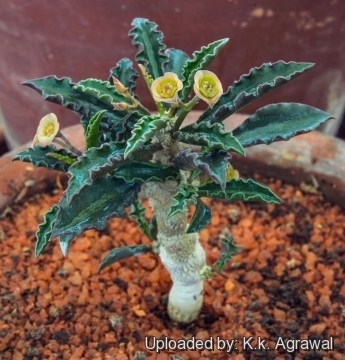 For the caudex-forming Madagascan euphorbias, such as Euphorbia capsaintemariensis, Euphorbia moratii, Euphorbia primulifolia or Euphorbia ambovombensis it is recommended as a stock Euphorbia milii var. hislopii.